Two (2) Taiwanese Nationals were arrested and crystal meth by bucketloads were seized in a raid yesterday, 05 July 2016 on a shabu laboratory in Las Piñas City. 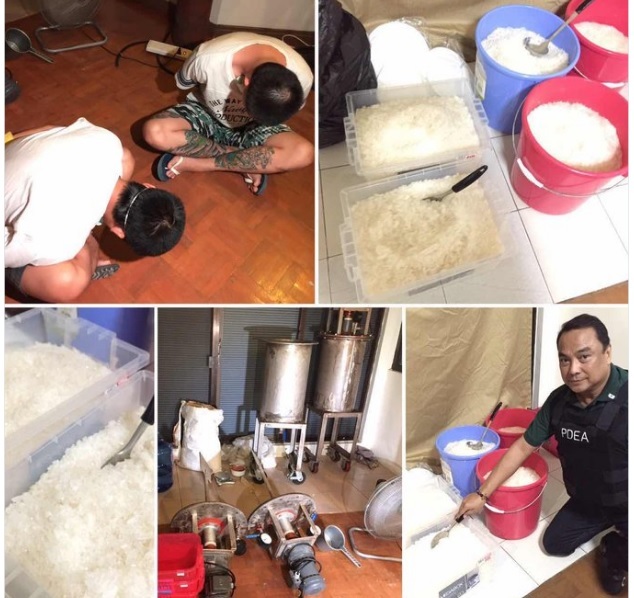 PDEA (Philippine Drug Enforcement Agency) officers swooped down on the suspected drug lab on Philamlife Village in Pamplona Dos, Las Piñas City and found the finished shabu product placed in buckets. Two alleged shabu "chemists" identified only as Art and Alex were arrested. The house was being used to cook, store, and package shabu before it is sold nationwide, said PDEA chief Isidro Lapena. The clandestine shabu lab is located just a mall and a village guardhouse. PDEA also raided another house at BF Homes, Phase 5 in Paranaque City. The two suspects are also using the house to manufacture shabu, said Wilkin Villanueva, PDEA regional director. The raids are the first operation of the PDEA under its "Oplan Firstblood" that targets clandestine shabu laboratories in the Philippines. ano bang gamot para lalaking nag kakaroon ng pangatlong itlog?